Subversive leaders in democracies do not tell their citizens where they wish to lead their societies. They hide their goals from their citizens because they understand that their citizens do not share their goals. Then once they achieve their unspoken goals, they present their people with a fait accompli and announce that only they are competent to shepherd their societies through the radical shift they undertook behind the public's back. Prime Minister Binyamin Netanyahu was hoping to avoid his clash with US President Barack Obama this past week in Washington. Four days before his showdown at the White House with the American leader, Netanyahu addressed the Knesset. His speech was the most dovish he had ever given. In it, he set out the parameters of the land concessions he is willing to make to the Palestinians, in the event they ever decide that they are interested in negotiating a final peace. Among other things, Netanyahu spoke for the first time about "settlement blocs," and so signaled that he would be willing to evacuate the more isolated Jewish communities in Judea and Samaria. He also spoke of a long term military presence in the Jordan Valley rather than Israeli sovereignty along the militarily vital plain. 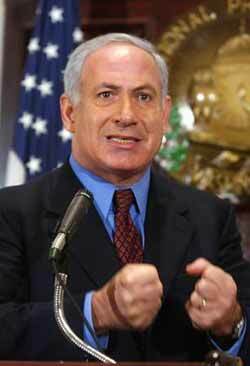 Both strategically and ideologically, Netanyahu's speech constituted a massive concession to Obama. The premier had good reason to believe that his speech would preempt any US demand for further Israeli concessions during his visit to Washington. Instead of welcoming Netanyahu's unprecedented concessions, Obama dismissed them as insufficient as he blindsided Netanyahu on Thursday with his speech at the State Department. There, just hours before Netanyahu was scheduled to fly off to meet him in the Oval Office, Obama adopted the Palestinian negotiating position by calling for Israel to accept that future negotiations will be based on the indefensible — indeed suicidal — 1949 armistice lines. So, just as he was about to board his plane, Netanyahu realized that his mission in the US capital had changed. His job wasn't to go along to get along. His job was to stop Obama from driving Israel's relations with the US off a cliff. Netanyahu was no longer going to Washington to explain where Israel will stand aside. He was going to Washington to explain what Israel stands for. Obama threw down the gauntlet. Netanyahu needed to pick it up by rallying both the Israeli people to his side and rallying the American people to Israel's side. Both goals, he realized could only be accomplished by presenting his vision of what Israel is and what it stands for. And Netanyahu did his job. He did his job brilliantly. Israel today is the target of an ever escalating campaign to demonize and delegitimize it. Just this week we learned that a dozen towns in Scotland have decided to ban Israeli books from their public libraries. One Scottish town has decided to post signs calling for its residents to boycott Israeli products and put a distinguishing mark, (yellow star, perhaps? ), on all Israeli products sold in local stores to warn residents away from them. Israelis shake their heads and wonder, what did we do to the Scots? In San Francisco, there is a proposition on the ballot for the fall elections to ban circumcision. The proposition would make it a criminal offense to carry out the oldest Jewish religious ritual. Offenders will be punished by up to a year in prison and a fine of up to a thousand dollars. Israelis shake their heads and wonder, what did we do to the people of San Francisco? It seems that everywhere we look we are told that we have no right to exist. From Ramallah to Gaza, to Egypt, to Scotland, Norway, and San Francisco we are told that we are evil and had better give up the store. And then Obama took to the stage on Thursday and told us that we have to surrender our ability to defend ourselves in order to make room for a Palestinian state run by terrorists committed to our destruction. But then Netanyahu arrived in Washington and said, "Enough already, we've had quite enough of this dangerous nonsense." And we felt things we haven't felt for a long time. We felt empowered. We felt we had a voice. We felt proud. We felt we had a leader. We felt relieved. The American people, whose overwhelming support for Israel was demonstrated by their representatives in both houses of the Congress on Tuesday, also felt empowered, proud and relieved. Because not only did Netanyahu eloquently remind them of why they stand with Israel, he reminded them of why everyone who truly loves freedom stands with America. It is true that the American lawmakers who interrupted Netanyahu's remarks dozens of times to applaud wanted to use his presence in their chamber to send a message of solidarity to the people of Israel. But during the course of his speech, it became apparent that it wasn't just their desire to show solidarity that made them stand and applaud so many times. Netanyahu managed to relieve them as well. Since he assumed office, Obama has been travelling the world apologizing for America's world leadership. He has been lecturing the American people about the need to subordinate America's national interests to global organizations like the United Nations which are controlled by dictatorships that despise them. Suddenly, here was an allied leader reminding them of why America is a great nation that leads the world by right, not by historical coincidence. It is not coincidental that many American and Israeli observers have described Netanyahu's speech as "Churchillian." Winston Churchill's leadership was a classic example of democratic leadership. And Netanyahu is Churchill's most fervent pupil. The democratic leadership model requires a leader to set out his vision of where his country must go and convince the public to follow him. That is what Churchill did. And that is what Netanyahu did this week. And like Churchill in June 1940, Netanyahu's success this week was dazzling. Just how dazzling was make clear by a Haaretz poll of the Israeli public conducted after Netanyahu's speech before the Congress. The poll found that Netanyahu's approval ratings increased an astounding 13 percent from 38 to 51 percent in one week. Two thirds of the Israelis who watched his speech said it made them proud. As for the US response, the fact that leading Democrats on Capitol Hill, House Minority Leader Steny Hoyer and Senate Majority Leader Harry Reid felt it necessary to distance themselves from Obama's statements about Israel's final borders makes clear that Netanyahu successfully rallied the American public to Israel's side. This point was also brought home with Democratic National Committee Chairwoman Cong. Debbie Wasserman Schultz's interesting request to Republicans during their joint meeting with Netanyahu. In front of the Israeli leader, Wasserman Schultz asked her Republican counterparts not to use support for Israel as a campaign issue. Her request makes clear that following Netanyahu's brilliant triumph in Washington, Democrats realize that the President's poor treatment of Israel is an issue that will harm them politically if the Republicans decide to make it an issue in next year's elections. While the democratic model of leadership is certainly the model that the founders of most democratic societies have in mind when they establish their democratic orders, it is not the only leadership model that guides leaders in democratic societies. This week, as Netanyahu demonstrated the strength of the democratic leadership model, two other leadership models were also on prominent display. The first was demonstrated by Obama. The second was exhibited by opposition leader Tzipi Livni. Obama's leadership model is the model of subversive leadership. Subversive leaders in democracies do not tell their citizens where they wish to lead their societies. They hide their goals from their citizens because they understand that their citizens do not share their goals. Then once they achieve their unspoken goals, they present their people with a fait accompli and announce that only they are competent to shepherd their societies through the radical shift they undertook behind the public's back. Prior to Obama, the clearest example of subversive leadership was Shimon Peres. As foreign minister under the late Yitzhak Rabin, Peres negotiated his deal with the PLO behind the public's back, and behind Rabin's back -- and against their clear opposition. Then he presented the deal that no one supported as a fait accompli. And as the architect of the deal that put the PLO terror forces on the outskirts of Israel's major cities, Peres argued that only he could be trusted to implement the deal he had crafted. Eighteen years and two thousand Israeli terror victims later, Israel still hasn't figured out how to extricate itself from his subversive legacy. And he is president. Today, Obama recognizes that the American public doesn't share his antipathy towards Israel, and so as he adopts policies antithetical to Israel's security, he waxes poetic about his commitment to Israel's security. So far his policies have led to the near disintegration of Israel's peace with Egypt, the establishment of a Fatah-Hamas unity government in the Palestinian Authority, and to Iran's steady, all but unimpeded progress towards the atom bomb. As for Livni, her model is leadership from behind. Although Obama's advisors claimed that this is his model of leadership, it actually is Livni's model. A leader who leads from behind is a follower. She sees where her voters are and she goes there. In Livni's case, her supporters are on the Left and their main spokesman is the media. Both the Left and the media oppose everything that Netanyahu does and everything he is. And so, as Livni sees things, her job as the head of the opposition is to give voice to their views. As Netanyahu stared Obama down in the Oval Office and reminded Israelis and Americans alike why we have a special relationship, Livni was telling audiences in Washington and Israel that Netanyahu is a warmonger who will lead us to devastation if we don't elect her to replace him soon. With Obama adopting the Palestinians' negotiating positions and with Fatah embracing Hamas rather than honestly admitting that all hope for peace is dead for the duration, Livni said that Netanyahu is leading us to war by defending the country. Netanyahu's extraordinary leadership this week has shown that when used well, the democratic model of leadership trumps all other models. He also showed us that he has the capacity to be the leader of our times. In the coming weeks and months, the threats to Israel will surely only increase. And with these escalating threats will come also the escalating need for strong and certain leadership. Netanyahu should realize what his astounding success means for him as well as for Israel. The people of Israel and our many friends around the world will continue to stand behind him proudly if he continues to lead us as well and wonderfully as he did this week. And we will admire him. And we will thank him.